Outstanding properties walk a fine line between consistent, reliable service offerings and fresh twists which appeal to repeat guests as they attract new customers. Milano’s Carlton Baglioni performs the world-class task to the highest degree. The first great impression of this superior five-star is its discreet, narrow entrance at 5 via Senato, hard to find from the street. Warn your cab driver to be on the look-out! Against a background of thick foliage the ever-engaging bellman Saïd has the talent to whisk you effortlessly inside the marble-floored lobby, where the magic begins. The warm welcome and super-pro skills of familiar faces like concierge Lino always make a return to the hotel a supremely hospitable experience. A dinner under the watchful eyes of the inestimable Vincenzo at il Baretto ristorante is a must-do during your stay. Recently, the Carlton renovated its front-facing garden, designing an accommodating leafy space ideal for a relaxing rendezvous or a quick al fresco spritz. We can’t say enough about the variety of lodging options available to the discerning traveller. 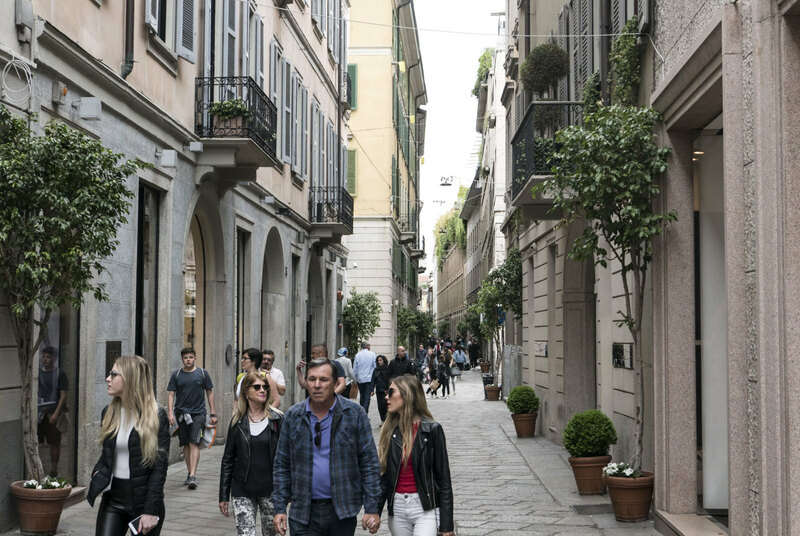 Terrace suites overlooking the via della Spiga provide a platform for private luxuriating, or voyeuristic people-watching, as the fashion-forward glitterati parade below. Among the team at Carlton Baglioni Milano are Vincenzo at il Baretto ristorante, Lino the concierge, and Saïd the bellman.